Beebe Healthcare is proud to welcome Sandeep Khehra, DPM, podiatrist, to Beebe Wound Healing & Hyperbaric Medicine. Dr. Khehra is working with patients who have ongoing wound issues. She has a special interest in diabetic foot wounds, which can often be the hardest to heal. 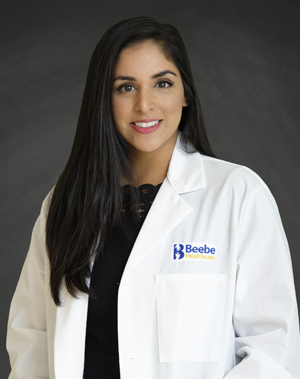 “I am excited to work with the team here at Beebe Wound Healing because there are many innovative treatments that we are using now to better heal injuries,” Dr. Khehra said. Hyperbaric oxygen therapy – the increased levels of oxygen in a hyperbaric chamber help improve wound healing when the standard of care has failed. New Fish Skin Grafts – Beebe Wound Healing is now using codfish grafts, which closely resemble human skin, sourced from the chilly waters of the Atlantic. The sterilized grafts are applied to wounds and have been shown to better heal damaged human tissue. These grafts, along with many other types of cellular tissue are applied in the office at Beebe Wound Healing. SonicOne® ultrasound debridement is used in the office to help remove damaged tissue from wounds. The machine allows Beebe Wound Healing to be highly selective of the tissue to remove while reducing blood loss and minimizing pain for the patient. Beebe Wound Healing utilizes BARA-MED hyperbaric oxygen chambers, recently adding a third chamber to provide services for a growing number of patients. Dr. Khehra grew up in California and attended University of California at Berkeley for her undergraduate degree in Integrative Biology. Following undergrad, she moved to Philadelphia where she earned her doctorate in podiatric medicine at Temple University. She went on to complete a 3-year residency at Crozer Chester Medical Center where she discovered her passion for wound care and healing. After completing her residency, she and her husband, podiatrist Allen Mirzaei, DPM, moved to Sussex County. Since 1998, Beebe Healthcare’s Wound Healing program has provided state-of-the-art wound care for the community. Beebe’s outcomes-driven program focuses on healing wounds quickly. The healing rate is consistently greater than 98 percent, exceeding the national average. Many of these wounds went untreated for weeks or months before receiving specialized wound care. Beebe Wound Healing & Hyperbaric Medicine is located at Beebe’s Rehoboth Beach Health Campus - Suite 210 in the Medical Arts Building. To learn more about Wound Healing at Beebe Healthcare, call (302) 645-3121 or go to www.beebehealthcare.org/wound-healing.